So this semester, I’m taking a German Literature course, entitled Knights, God and the Devil. We had our first class meeting last Tuesday and I’m completely enthralled by what we are currently reading: Das Niebelungenlied. Even though I majored in German, somehow I missed this seminal work of German literature. 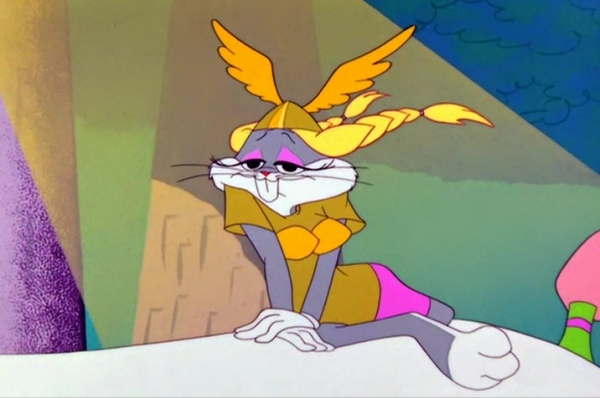 It’s absolutely fascinating to me, about knights, kings, jousting tournaments, a magic cape and, oh, yeah, an incredibly strong female character named Brünhild. This image of her is from an 1897 postcard by the artist Gaston Bussière. Before really studying Brünhild and the Niebelungens, most of what I knew about the story (which, admittedly, was very little) came from Richard Wagner’s operatic Ring Cycle. His tale diverges from the legends; also, Brünhild and some of the other major characters like Siegfried appear in other Nordic sagas, but they don’t always play the same role. 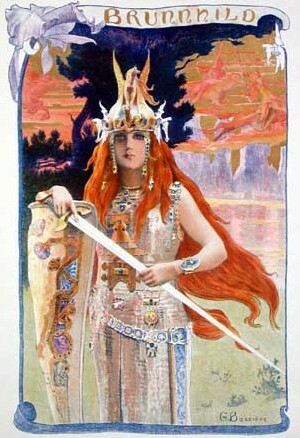 In Das Niebelungenlied, Brünhild is a woman of astounding power. She happens to be quite beautiful and she is a powerful queen in her kingdom (Island). Long story short, King Gunther from the German city of Worms decides he wants to marry the powerful queen Brünhild. (Why is it that the men always assume that they can simply choose their bride without consulting her first? Is this courtly love? I am sure I shall find out!). Gunther consults his best men, including Siegfried. Siegfried is a king from his own country but wishes to marry Gunther’s sister Kriemhild (once again, Siegfried simply decides one day that this is the woman he wants to marry. Fortunately, when they see each other for the first time, it is love at first sight). Anyway, Siegfried advises Gunther to take him along on the trip to Island, which is Brünhild’s land. Siegfried has a magical cloak, a Tarnkappe, which renders him invisible. How he acquired the cloak is another story that I’d like to read some day. At any rate, Siegfried knows of Brünhild’s power and must help Gunther defeat Brünhild in three contests. The men prevail, but not without fearing for their lives. Look at Brünhild, just comfortably lounging there in her white gown, while her newly acquired husband is bound and hanging like an animal. She lets him down…eventually. He returns to the wedding bed but basically stays as far away from her as possible. The next morning, Siegfried, knowing her power, discretely inquires how Gunther’s wedding night went. Gunther, poor man, is completely depressed and despondent. 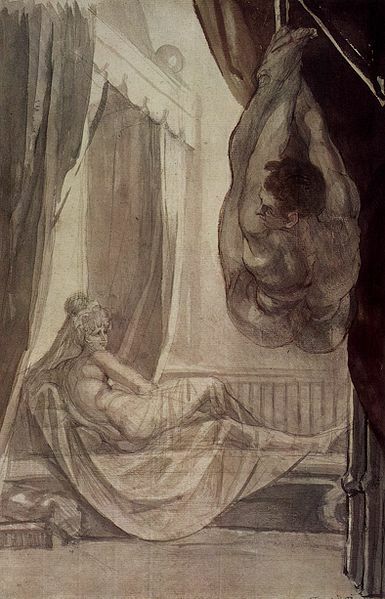 Siegfried decides to help by disguising himself with his cloak of invisibility and fights Brünhild in the wedding bed, then when it’s clear he prevails over Brünhild, he quietly slips away and lets Gunther take his rightful place as Brünhild’s husband. And, once she and Gunther consummate their marriage, she loses her extraordinary powers and becomes like any other woman. But there’s a whole lot of interesting ideas in that very fact: her virginity is what lets her keep her extraordinary strength and power; by becoming a married woman, she gives up her power. I have a feeling I’m going to be writing about this for my class and I’m eager to do some research on it. It’s wonderful. Horribly inaccurate, but wonderful. 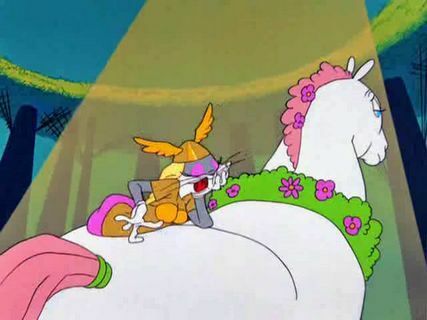 And clearly, the Looney Tunes artists are making fun of high Wagnerian opera. On that note, I leave you with: SMOG! If you know the cartoon, you’ll know what I mean. We hope that all of our visitors to our blog have had a Merry Christmas! It’s hard to fathom that is almost 2012 and we wish everyone “einen guten Rutsch ins neue Jahr” (a German expression wishing a good start to the New Year). I resolve to update the blog more frequently in 2012. I haven’t written anything lately because of our move back to Indiana in the US and because I’m not sure which direction I wish to take for our blog. I have decided to continue writing about our family and also to write about issues relating to the German language and culture, and also teaching. Briefly, here is what we have been doing for the past four months. We arrived in the US in early September. Very shortly after our arrival, I was offered a temporary teaching position in a nearby high school. A German teacher there was on maternity leave, so it was a perfect opportunity for me. I finished teaching at the end of November and loved the students, the school district and of course was thrilled to be teaching about the German language and culture that I love so much. I know that many of the students benefited from hearing about my experiences living in Bavaria. It also made me realize just how much I personally have learned from our three years in Bavaria. In early October, our household goods arrived at our home in Indiana. We still have tons of boxes to unpack. One of my New Year’s resolutions is to unpack at least one box every week. In November, besides keeping busy with teaching, we celebrated Thanksgiving with my side of the family. That was wonderful. Thanksgiving really is my favorite holiday, one which I missed while living in Europe. It never felt quite the same in Germany, when it was essentially just us celebrating this unique holiday. I also severely sprained my ankle in November. You see, Rosebud is now going to Samstagschule to keep up with her German. The Deutschschule is on Saturday mornings at the International School of Indiana, and the program is run through IUPUI (Indiana U.-Purdue U. at Indianapolis). On this one particular Saturday, I was asked to substitute teach Rosebud’s class. A few of the children got away from the group and as I was chasing after them, I fell and immediately realized I had probably sprained my ankle. My ankle is much better than it was, but it has made it a little hard for me to get around, especially at first. Then, this December, we have been quite busy with the holidays. I must say, as much as I miss Christmas in Germany and the Christkindlmarkt (among other things), it has been so good to be home with family to celebrate. Even though we came home for Christmas each of the years we were living in Germany, it’s different when you are living in proximity to family and have less time constraints due to travel. But I have fondly thought about my visits the the Christkindlmarkt in Bad Tölz, among others, and the beautiful snow in Bavaria that you get this time of year. It’s been unseasonably warm here in Indianapolis, and in that regard, it hasn’t quite felt like Christmas to me. I miss the delicious foods you can buy at this time of year in Germany, the simple and tasteful decorations and most significantly, the lesser amount of commercialism in Germany. I’ve really been struck by just how commercial the season has become here in the United States, and that bothers me. Anyway, we are all doing well and looking forward to 2012. We plan to travel quite a bit. David and I will go to Palm Springs, California at the end of January; in March, I hope to go to Kansas with the children as our dear neighbors in Germany will be there visiting their family and then over the summer, I am eager to return to Bavaria to visit our friends there. Lately, I’ve been dreaming of Bavaria and feel at times like the language and culture are slipping away from me, so I feel like I must visit! Best wishes to all of you and a very happy, blessed New Year in 2012. 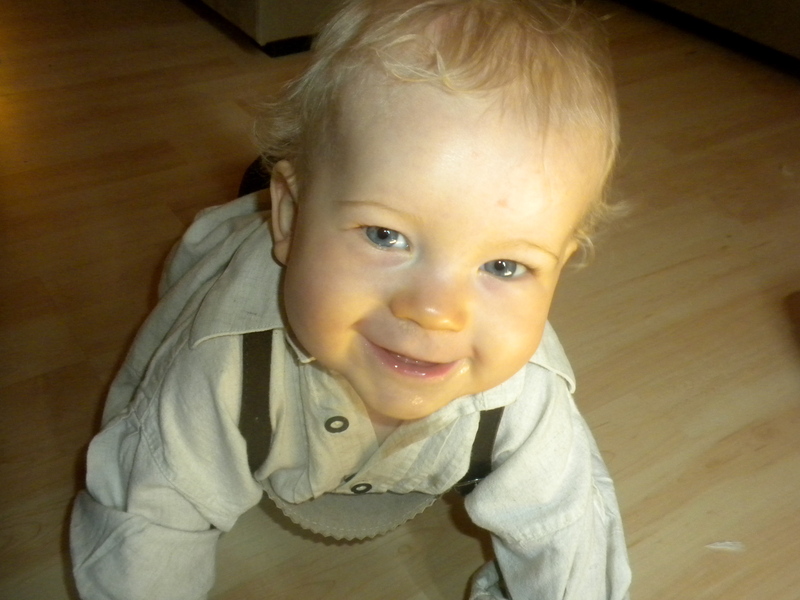 Much to my amazement, Superdude will be one at the end of September. How time quickly flies! As an early birthday present (and as a souvenir of our time here in Bavaria), we bought him a pair of Lederhose, the famous Bavarian/Austrian leather pants. I still need to purchase a shirt to go with the Lederhose, so he borrowed one of Rosebud’s. Isn’t he sweet in his Lederhose? The word “Bub” by the way is a Bavarian/Austrian word for boy; one Bavarian variant of Bub is Bua which sounds an awful lot like our English word boy. He certainly looks like a Bavarian, with his fair hair and blue eyes. Most of our friends and family know that our time in Bavaria is coming to a close. At the tail end of July, David was offered a new position at a company in Indianapolis. His new job begins on September 12, so we will be moving back home a few days before that. When we first moved to Bavaria, we intended to stay here for awhile. Once we are back in Indiana, it will have been after three years here and I feel like the time has just flown by so quickly. Ultimately, this is a good move for our family as we will be near our extended family and friends back home. That is not to say I will not miss living in Germany and Bavaria, quite the contrary. 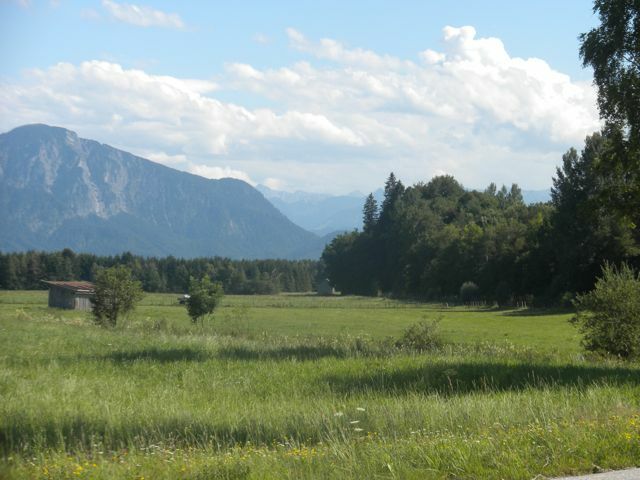 There have been many advantages to living where we do: we’ve loved all the hiking and sight-seeing spots that are so close by; we’ve enjoyed all the kid-friendly activities; we’ve especially loved living within such close proximity to the world-class city of Munich. What will I miss most of all? My friends here, of course. I’ve been so touched by the kindness of my German mama friends and their families, and they’ve done more for me than I can possibly say. As for this blog, I do intend to update it, as often as I do now (which is about twice a month – I’d like to update it more frequently than that, but having little kids affords me less time than I’d like to write). I will continue to write about the German-speaking world, as it is my passion. Without a doubt, I know I’ll travel back to Germany with Rosebud and Superdude so they continue to be exposed to the language and culture. Having them learn the language and appreciate that things are done differently is extremely important to me. As I am a German teacher, I have plenty of contacts within the German community in Indianapolis. I hope to go back to teaching German, provided I can find the right position. I miss teaching more than anything; now that I’ve lived in Germany for three years, I can share my experiences and knowledge of living here with my students. For a non-native speaking teacher, that’s quite remarkable and something that will benefit future students. Our daughter Rosebud’s German is really taking off, so I’m especially saddened that we are moving at this crucial point in her language acquisition. Fortunately, I have found a Saturday morning German language program for kids between the ages of 3-12. The program is offered by Indiana U-Purdue U at Indianapolis (IUPUI) and run by a colleague of mine. I’m very excited that Rosebud has at least this option to continue learning German and to meet other kids who will be learning the language with her. So that is our family news. We have a lot to accomplish in the next three weeks. More importantly, there are some local places I hope we can visit before we leave. It’s a little strange to be doing things for the last time, or at least, for quite awhile before I can make a return visit. It’s been a busy summer for the Bowmans in Bavaria. 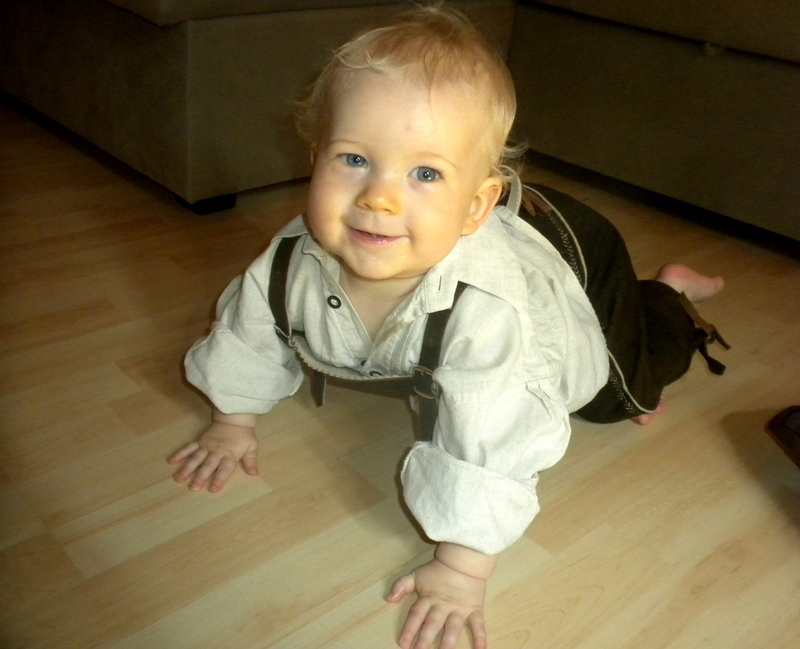 Superdude is crawling after his sister Rosebud; for her part, Rosebud is speaking more and more German (simple phrases, mostly). She’s also quite the little conversationalist in English. I’m really enjoying these two kids and feel extraordinarily lucky to have them. A week ago Saturday, I had the opportunity to do something I’ve been meaning to do for a long time: I went to a Trachten shop to buy myself a Dirndl. Tracht is the word for costume (plural: Trachten). When most Americans think of Germany, they usually think of Bavaria and the traditional costume that is worn in this region of the world. 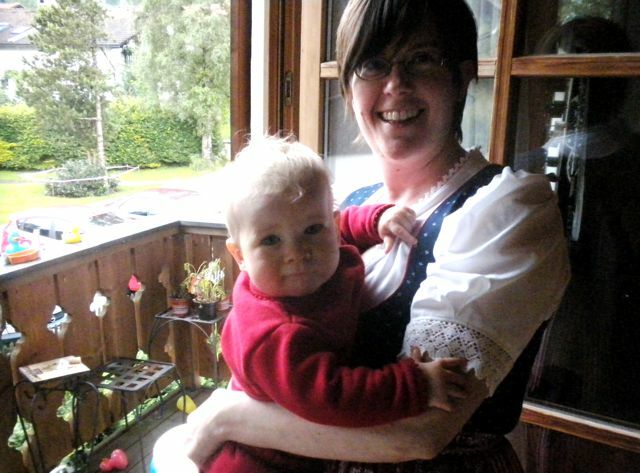 From when we first moved to Upper Bavaria, I always admired the Dirndl dresses. One of my friends asked me how often people here wear them. Not everyone wears the traditional clothing, but of those who do, I most often see it on the weekend, especially Sunday and on festival days. There are some Bavarians who also wear their traditional clothing during the week, and even some who will only wear the traditional clothing (though this seems to be mostly older people). There’s an elderly gentleman I see from time to time when we go on walks. He doesn’t wear the full Lederhosen (leather pants) outfit but he usually has on a Bavarian shirt and hat at the very least. 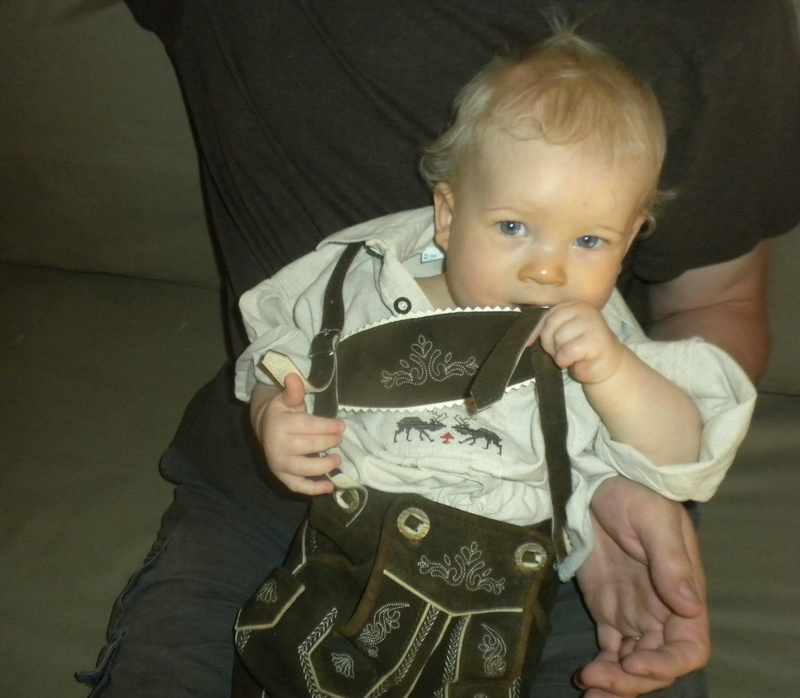 If you visit Munich, you will certainly see people of all ages wearing Trachten, and not just the Biergarten servers! I think wearing the traditional costume is a little more common where we live, in Oberbayern (Upper Bavaria) as well as in parts of Austria which shares a similar style of traditional dress. Believe it or not, Trachten has its own fashion industry and from what I understand, one of the design centers is Salzburg, Austria. Each season has its colors and patterns for that year, with there being a special emphasis on Oktoberfest. I couldn’t tell you what the Dirndl trends are for this year, mind you! Traditionally, each locale has its own variant of the costume, including fabric colors and hat designs. I don’t know a lot about that, however. I decided I wanted to get good advice and customer service in my Dirndl purchase, so I went to a shop called Trachtenstube Inge which came highly recommended to me. All of the sale associates were beautifully dressed in Trachten. I was very well attended to by a woman who took the time to explain the different types of Dirndl. I learned that for festivals the skirts tend to be black or at least dark in color. You can even buy a special bridal Dirndl, often in ivory or white, but sometimes in different colors and made of luxurious fabrics. As I wanted a more everyday Dirndl, she directed me toward what she called the “Wasch-Dirndl” – a “wash” Dirndl, or something you can easily launder yourself. The colors tend to be brighter in these everyday dresses. The more traditional Dirndl has a long skirt, but the short skirt is especially popular for the summer and also for Oktoberfest. The Dirndlbluse, or Dirndl blouse, is not a full blouse, but rather a half-blouse that is snug around the bust area. The sleeves and neckline can be lacy, plain or everything in between; the ones I tried all had three-quarter sleeves. I don’t know if that is the traditional sleeve length or if that is a modern twist on the Dirndl blouse. I found seven or eight long-skirted Dirndl that I wanted to try on, and as the prices were better than what I had anticipated, I thought maybe I would be able to buy two for myself. As I tried on the various Dirndl I had selected, the saleslady and I decided that the stronger colors suited me very well. The first one I tried had a green bodice and a purple skirt, a combination which I liked. Soon after that, I discovered one with a purple bodice and green skirt, with a pink and white apron, which fit me very well indeed. I immediately knew that this was my Dirndl. It reminded me of when I bought my wedding dress, actually, in that I had no doubt whatsoever that it was the Dirndl meant for me. 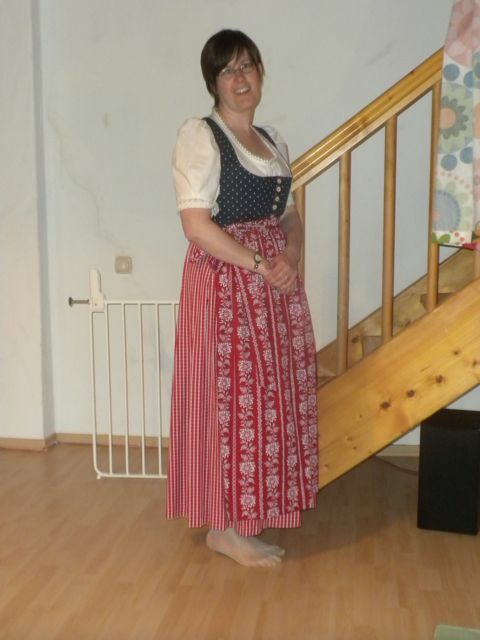 My "American" Dirndl, red, white and blue! It really was too perfect to pass up. Once I determined to buy both of these Dirndl, another beautifully dressed woman scurried over to me, with her pincushion, so she could do the fitting and pinning for a few minor alterations. She said it would take a few days before she could get to the alterations for me. All week long I was eager to get my dresses back so I could try them on again. 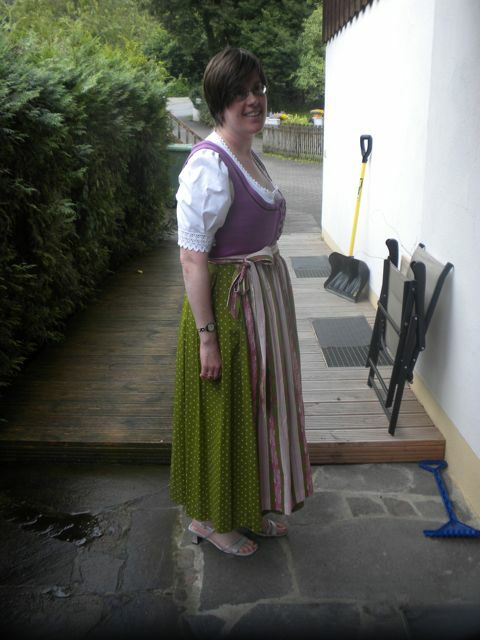 When I did finally pick up my Dirndl, I decided to show my neighbors the purple and green one. They were charmed by their American neighbor dressing up and looking like one of their own. 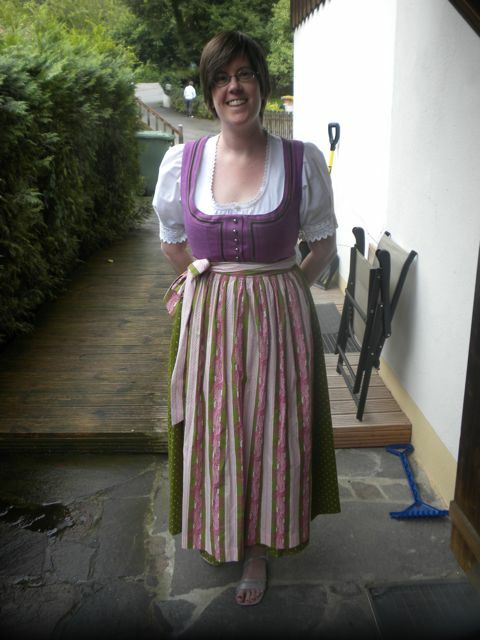 I even wore my Dirndl out to dinner at the local pizza restaurant. My husband kept commenting on how cute I looked, so I think I’ll wear my Dirndl somewhat regularly since he appreciated what it did for my figure. I think that Dirndl dresses are flattering on pretty much any woman and not only that, I just feel so magically transformed when I put it on. The other day, when I went to my Frauengymnastikkurs (Women’s Fitness class), the other women who arrived before me were chatting about when their babies were born. It took me about a minute to figure out what they were discussing, however, because they were speaking a mixture of Hochdeutsch and Boarisch. In other words, they were code-switching between German and Bavarian. What does code-switching mean? It’s a phenomenon that occurs when someone is fluent in more than one language; basically, someone who speaks two languages or more will switch between the languages as appropriate. As a person who is fluent in German, French and English, I code-switch all the time. When I’m shopping with my children, I’ll speak to them in English but once I am in a situation where I need to talk to a German, I switch to using the German language. Sometimes if I need to tell Rosebud something, I use both German and English, switching back and forth between the languages because I don’t want to alienate a German speaker who may not understand English. Here at home, we mostly speak English but we throw in German words and expressions because there’s either not a good English translation or we simply can’t think of the English word. For some reason, we say “Wasserkocher” instead of “Electric kettle”, maybe because “Wasserkocher” (“Water cooker”) is more fun to say. Truthfully, code-switching is not even something I think about doing, for the code-switching simply happens. One of the women in my Women’s Fitness class mostly speaks Bavarian, and although I miss some of the vocabulary she uses, I’ve been living here in Bavaria long enough that I’m generally familiar with the dialect to understand the gist of the conversation but only sometimes. Other times, I’m completely at a loss. I, however, can’t speak Bavarian at all. I haven’t even really tried (apart from using simple words like “pfiati”, which means “bye bye”). I think that if I were to try speaking Boarisch, my friends would probably tease me and be highly amused, although if they were to ply me with a beer or glass of Grüner Veltliner, perhaps I’d be more willing to give it a go. Most of the Bavarians born and raised here who I’ve encountered will either speak to me in a mixture of German and Bavarian, or they will immediately switch to standard German once they realize that I’m not a native speaker. One of my neighbors always speaks a mixture of Bavarian and standard German to me (there’s that code-switching again!). I suspect her usage of both with me is partially generational, in that I’m sure she grew up only speaking Bavarian at home, but a mix of Bavarian and standard German at school. When we first moved in to our house back in February 2009, I couldn’t understand her at all, apart from one or two words here and there. But as I’ve listened to Bavarian and have talked with my neighbor and others while out and about, I’ve become a little more adept at understanding individual words and overall ideas when the Bavarian words are used. Here are a few examples: the German word “gut” becomes “guat” in Bavarian. One interesting Bavarian word is “Bua” which means “Junge” in standard German, and “boy” in English. I think it’s fascinating that “Bua” sounds a lot like “boy”. From my perspective as a non-native speaker, Bavarian sort of sounds like German with a strong shift in the vowels with consonant-dropping along with its own set of vocabulary. Bavarian also feels a little less formal to me than standard German, maybe because it’s especially used between family members who would otherwise speak standard German when they’re with non-Bavarians. Some other phrases: “i mog di” means “ich mag dich” in standard German, or, “I like/love you”. Another expression I hear all the time is “gell?” which means “nicht wahr?” or “right?”. If you want to sound like a local, or at least make the locals smile when they know you’re not a native, you can always toss in a “gell?” at the end of your conversation. One American friend of mine, who is married to a German and lives in the northern part of Germany, said that she and her husband both have difficulty understanding Bavarians. Germans from other parts of Germany have told me the same thing and, in fact, often say something like, “Bavarian is like a different language”. I really am fascinated by how people switch back and forth between Bavarian and German, just as I do between German and English (or French and English, when in a French-speaking situation). I suppose it’s a bit different, because for Bavarians, they have grown up as native speakers of both their local Bavarian dialect and standard German whereas in my case, I’m fluent in German but not a native speaker. For the translation of “Schmarrn” (“nonsense” or something a bit stronger than that, if you catch my drift) the German phrase given is “da bin ich anderer Meinung” (“I’ve got a different opinion” or “I don’t agree”). Schmarrn, by the way, is a pretty common expression here in Bavaria. It’s not a word I heard much, if at all, when I was an exchange student up in Köln.